For a person who has been wedded to bicycle transportation for about 25 years, it's a wonder that it took me so long to visit Amsterdam, where nearly every resident of every age rides a bike in every kind of weather, without making too big of a deal about it. Well, I finally made my pilgrimage, and had a great time biking the canalside streets and parks of the central area on a clunky rented one-speed girl's bike with a flowered seatcover and chopper handlebars that let me lean back until I was almost horizontal. 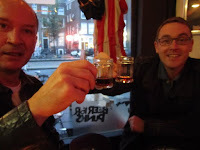 The icing on the cake is that Amsterdam is also a fabulous beer destination, as I noted in previous posts about 't Arendsnest (my favorite place in Amsterdam) and Gollem's Proeflokaal. I had a great beer time there even though I missed several of the "must-visit" beer establishments: bars In De Wildeman and Café Belgique, and bottleshop De Bierkoning. I did make it into one excellent bottleshop -- De Gekraakte Ketel (the Cracked Kettle) -- across the alleyway from the original (and currently closed) Gollem's location. The picture above of the bicycle with the crate of Westvleteren empties is the Cracked Kettle's sandwich-board -- it would make a better picture if the front tire had air in it. The rambling split-level shop had a good selection of Dutch and Belgian beers -- I grabbed a bottle of Columbus strong pale ale from 't IJ brewery, and a bargain-priced 750 ml Cantillon Iris ($10.50). I inquired about Westvleteren based on the crate out front, but all they had in stock were a few 1996 bottles of the 12, priced (if I remember right) at €50 ($70) each. Other geek-worthy beers were to be found there also, including some American offerings, and BrewDog's viagra-laced Royal Virility Performance. Seeing as how Gollem's was closed, a clerk at the Gekraakte Ketel recommended a replacement bar for us: De Zotte Belgisch Bierproeflokaal. The jawbreaker "Proeflokaal" that you see in these bar names means "tasting room". It was a nice place on a quiet side street just outside the canal district. At a little after 4 PM on a weekday, we were alone in the place with the bartender, the pub cat, and some kids from across the street that came in to use the restroom. 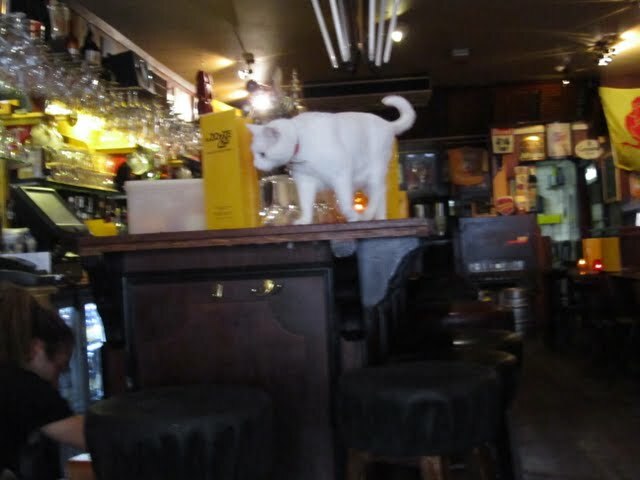 The cat became quite interested in the block of cheese that was coming out of the refrigerator below the bar, and hopped right up there for a taste. There was a good selection of Belgian bottles, and a few taps (6-10 if I remember right). Another place worth mentioning is The Beer Temple, which bills itself as an American beer bar. It's owned by the Arend family that runs the fabulous Arendsnest. There are an impressive number of American beers on tap, from the likes of Great Divide, Rogue, Left Hand, Anchor, and other quality brewers. In addition, there are a few Dutch and Belgian taps, and some lighter fare like Beck's and Hoegaarden. Nice pubby atmosphere like 't Arendsnest, but the beer selection is wasted on an Oregon beer snob -- too much focus on stuff I can get cheaper and fresher at home. One interesting thing is that the Beer Temple was offering 20 ml -- about two-thirds of an ounce -- of BrewDog's Sink the Bismarck for €8.50, or Tactical Nuclear Penguin for €7.50 ($12 and $10.50). 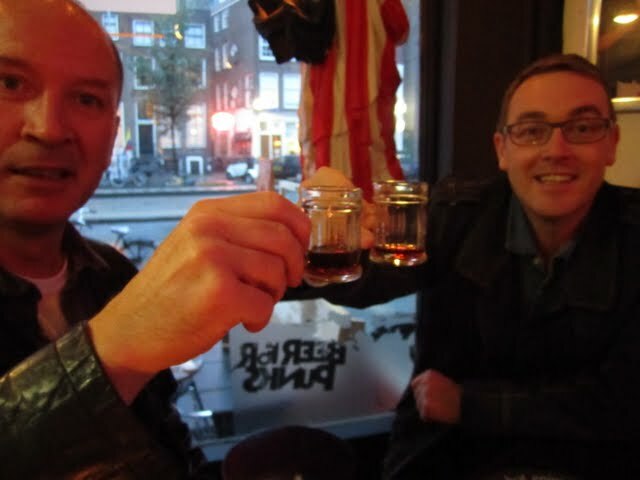 The British gents in the picture had ordered shots of TNP in tiny beer steins and were generously sharing it with the other patrons. We decided it had an herbal character, kind of like an Italian Amaro. Whoa, that's an SPE of $1277.58 for Sink the Bismarck! It's just a lucky accident that the picture shows a BrewDog "Beer for Punks" banner reflected in the window behind them. 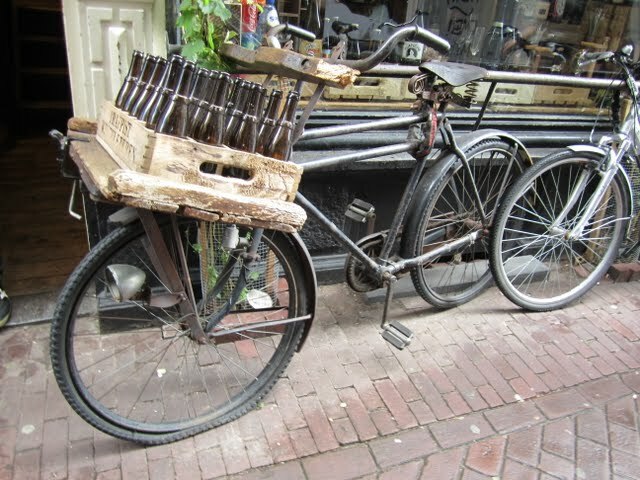 The proeflokaals and bottle shops will keep you busy and well-beered in Amsterdam. Supermarkets also had a few drinkable options on the shelf -- some La Trappe varieties and some widely-distributed Belgians like Duvel. On our first night in town, I grabbed a couple of "lentebocks" off the shelf, since we wouldn't be leaving the apartment that night. Grolsch's was sickly-sweet, a real struggle to get through, but a brewery called Hertog Jan had made a very nice, copper-colored maibock with the right balance of malt richness and lagered crispness. It was packaged like a cheap supermarket brand with a few different beer styles, but it was a solid choice for the refrigerator shelf. I'm glad I finally made it to Amsterdam. Now I've got to find a way to get back there again. I was in Amsterdam two years ago and i was impressed. Unfortunately i had no time to visit around it very well because i was there for only two days, but i hope to visit it again very soon. I recommend this place, it is very nice. Sounds fantastic. I wish I'd known about this stuff when I visited...20 years ago. But maybe someday in the future!